Runtime: 3 hr. 13 min. 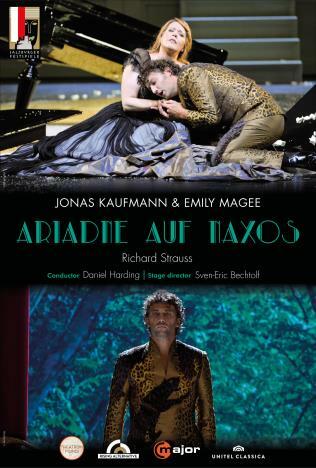 Ariadne auf Naxos is in two parts, called the Prologue and the Opera. The first part shows the backstage circumstances leading up to the second part, which is in fact an opera within an opera. The first opera premiere of the Vienna Philharmonic at the 2012 Salzburg Festival – conducted by Daniel Harding – featured a familiar work in an unfamiliar guise: Richard Strauss’ Ariadne auf Naxos had its world premiere in the original version one hundred years ago. The Salzburg Festival celebrated this anniversary as homage to the three founding fathers as well, since Strauss and Hofmannsthal dedicated this opera to Max Reinhardt. Ariadne auf Naxos was the third collaboration by Richard Strauss and Hugo von Hofmannsthal, written directly after the great success of Der Rosenkavalier. Originally planned as a “divertissement with a small chamber orchestra”, the project expanded into a grand venture combining opera, drama and ballet – and was a flop at its world premiere in 1912. The Salzburg Festival pledged to fulfill “the still-wonderful dream of its creators: to bring together the different genres of theater, ballet, drama, music and singing.” Sven-Eric Bechtolf directed this unconventional production, and had not only adapted Molière’s play Le Bourgeois gentilhomme, which preceded the opera at the time, but also reinstated the ballet music written for it subsequently. “A hundred years have passed since Hofmannsthal began to work on this tale with the fiercely practical and dramaturgically highly talented Strauss, one hundred years since the disastrous world premiere of Ariadne auf Naxos. We take this ‘anniversary’ as an opportunity to revisit the original version. And where would this make more sense than in Salzburg?” (Sven-Eric Bechtolf). Libretto by Hugo von Hofmannsthal based on Le Bourgeois Gentilhomme by Molière and the greek myth of Ariadna and Bacchus.